Monsters, monster and... more monsters! Publisher's blurb: "As heroes grow in power, they seek out more formidable adversaries. Whether sinister or seductive, ferocious or foul, the creatures lurking within these pages will challenge the most experienced characters of any campaign. "This supplement for the D&D game unleashes a horde of monsters to confront characters at all levels of play, including several with Challenge Ratings of 21 or higher. Inside are old favorites such as the death knight and the gem dragons, as well as all-new creatures such as the bronze serpent, the effigy, and the fiendwurm. 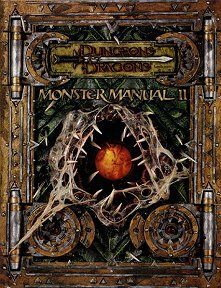 Along with updated and expanded monster creation rules, Monster Manual II provides an inexhaustible source of ways to keep even the toughest heroes fighting and running for their lives."